Ever since being established in 1959 as a charter member of the American Football League (AFL), the Buffalo Bills have been owned and controlled by one man. So it may have come as a surprise to some when on January 1, 2013 that 94-year old Ralph Wilson gave complete authority to Russ Brandon, the team's CEO and President. It was five days later that the Bills had hired Syracuse University Head Coach Doug Marrone to the same position. To say these moves were welcomed would be an understatement. Seeing as Niagara University is located about 30 minutes from Ralph Wilson Stadium, many members of the NU community had opinions on the new power structure with the Bills. "This is honestly the most excited I've been for an upcoming season that I can remember," said Derek Puff, Assistant Director of Recreation and life-long Bills fan. While the Bills have not made a playoff appearance since 1999, the franchise is infamous for being the only NFL team to play in four consecutive Super Bowls. Unfortunately, they lost all four of the games. However, the past doesn't seem to matter to some locals I spoke to. "You would think one of these years this team would make the playoffs by accident. Why not this year?" said Freshman Thomas Shay. "It's a fresh start for the whole organization. Hopefully they can get a QB that can actually throw the ball," Shay went on to say. The franchise has featured many all-time great players including O.J. Simpson, Bruce Smith, Jim Kelly, Thurman Thomas and Andre Reed. Even though those players never brought the Vince Lombardi Trophy to 1 Bills Drive, they are beloved figures in the community. Though those players are long gone from their time on the field, their mark is still on the organization with Kelly as the all-time leader in passing yards, Thomas in rushing yards and Reed in receiving yards. While the Bills have some pieces on their roster that the new front office can work with, the fans want more. Junior Ryan McDonnell put it best when I asked his opinion on the current roster. "The NFL is a passing league these days. Does Kevin Kolb really scare any of the other teams? No." he said. "If you don't have a franchise QB to build around, you have nothing," he went on to say. To see if the Bills find their franchise QB, tune into the 2013 NFL Draft from April 25-27 on ESPN. 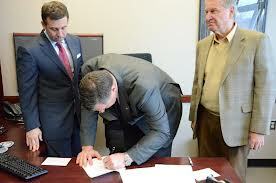 Photos of press conference of Russ Brandon's elevation to President/C.E.O.